Nearly two years ago, in January 2013, MPC collaborated with a team of journalists to create the Syrianrefugees.eu website, a dedicated resource that monitors the EU’s response to the crisis and highlights the human stories of those who have taken refuge in neighbouring countries and Europe. In October this site received a major update. 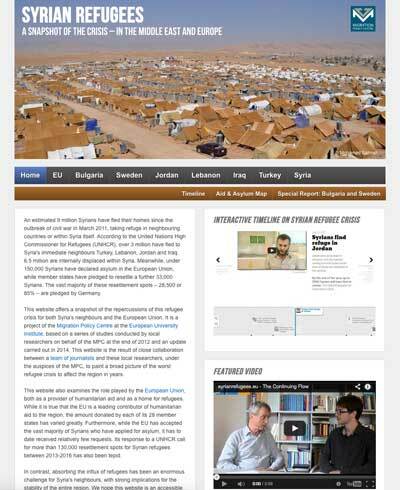 Video interviews on the crisis and refreshed statistics on Syrian asylum seekers to Europe and humanitarian aid dollars were added. Two new sections of rich, multimedia content covering those refugees who have sought protection in Sweden and Bulgaria were also created. ← Previous Previous post: Migration and Mobility in Ukraine: what is the impact of the current military conflict?